Meetings Meetings are held the third Wednesday of each month, 7 PM at Gateway Centre Executive Suites, 1313 E. Maple Street in Bellingham. Meetings Meetings every second Thursday at 7:00PM at at the Burlington Public Library which is located at 820 E Washington Ave, Burlington, WA 98233. Visit us on Facebook. Meetings Whidbees meets the first Wednesday of the month at the Freeland Library, 7:00 pm. Meetings Meets on the second Saturday of the month at the Jefferson County Library in Port Hadlock; 620 Cedar Avenue, Port Hadlock, WA 98339. Meetings Meets on the 3rd Tuesday of every month at Jackson Scout Hall in Old Silverdale, 9161 Washington Ave NW, Silverdale WA 98383, a short 1/2 mile from Stedman's Bee Supplies. Meetings begin at 7 PM, and there will often be a speaker to present a topic of interest at 8 PM. Meetings Meets at the Three Rivers Bible Church, 102 Harris Street - Kelso, WA on the 3rd Thursday from 7:00 to 9:00 pm except September and December. Meetings Meetings are 2nd Thursdays, 6 p.m., Centralia College, Washington Hall, room 103, 701 W. Walnut St., Centralia, except for July and December, which are special events. Meetings Meetings are held on the first Monday of the month at 7:30 PM at the Almendinger Building, WSU Extension Center, 7612 Pioneer Way East, Puyallup, WA. Meetings Meetings are on the second Monday of each month, except July and August, at the Chinook Middle School, 4301 6th Ave. NE Lacey. 6:00 p.m. For the Beginning Beekeeper's Certification Program. 7:00 p.m. Association meetings are held in the cafeteria. The Beginning Beekeeping class meets in the Science room next to the cafeteria. Meetings Meeting are the last Monday of the month except for Oct, Nov, Dec, and Jan. We meet at the 78th Street Heritage Farm, 1919 NE 78th Street, Vancouver, WA 98665 at 6:30 PM. Website Like us on Face Book, Pacific Northwest Queen Rearing Club. Meetings Meets the first Tuesday of each month at 6:00 PM in the Dr.
110 South 9th Avenue, Yakima. Meetings Monthly meetings of the MCBA are held 2nd Tuesday of the month at the Richland Church of Christ, 933 Thayer Drive. Doors open at 6:15 p.m., meeting starts at 6:30 p.m. Everyone is welcome. Meetings Bee Chat - usually the 2nd Thursday of the month are held at a local restaurant. Check Facebook for location is not always the same. Meetings The club meets the third Monday of the month (except December & January) at The Attic, 314 2nd Street, Moscow. Come to the back of the house and up the stairs to the meeting room. Meetings Meets the 2nd Friday of every month at 7:30 PM at the Spokane County Ag Extension Office by the County Fairgrounds, at 222 N. Havana, Spokane, WA. Meetings Pizza Factory, 123 S. Broad Street, Medical Lake. Meets the third Friday of each month. Pizza starts 6 pm, the educational presentation starts at 6:30 and the meeting at 7 pm. Meetings 3rd Thursday of every month at the Lower level of the Deer Park City Hall located at 316 E Crawford, Deer Park, WA 99006, at 6:30 pm. Find your local organization and attend a meeting. Local organizations are a great source of information and camaraderie. 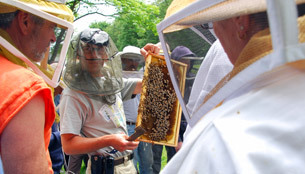 Meet fellow beekeepers, share knowledge and keep up with current issues effecting honeybees in your area.